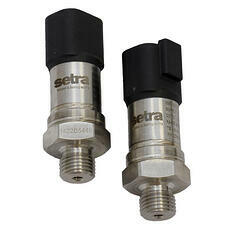 316L Stainless Steel - The sensor and all wetted materials are manufactured using 316L stainless steel. The design of the sensor gives the 3550 high corrosion resistance for the harsh conditions of the alternative fuels market. The unit is calibrated to an accuracy of ±0.25% FS across the entire pressure range offering. Pressure Flexibility - The Model 3550 design incorporates gauge, absolute and compound pressure datums all in the same package. Pressure ranges are available from 15 PSI to 250 PSI, making it ideal for OEM applications of all types. Flexibility for Many Applications - The 3550 transducer offers many pressure and electrical fittings covering many application configurations, minimizing additional engineering time to accommodate the sensor, leading to quicker project completion and faster time to market.